Het betrekking op slegs die 10 selfregerende tuislande wat daar was voor 1994, dit sluit die bevolkings in wat in 1994 reeds oor die 20 miljoen was, en sluit die Khoi san volke hierby uit, ook hulle is “aparte trusgtgebiede” of cpa’s wat slegs vir hul eie bevolkingsgroepe is, grondgebiede is nie vir ander volke nie, net hul eie. 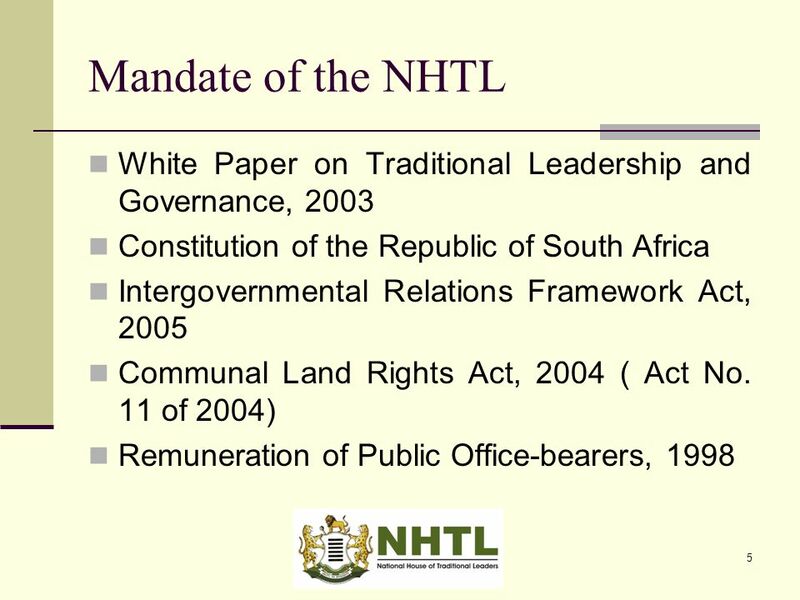 The White Paper on Traditional Leadership and Governance, July 2003, issued by the Minister for Provincial and Local Government deals with certain aspects, like the various international agreements, as well as the historical traditional leadership, the old homelands and what happened after 1994. The 2003 document stated that each traditional community was an entity and independent from the others. Such communities did not constitute a nation state as we understand it today. Prior to colonial invasion, these societies comprised structures and hierarchies stemming from a social organisation that was defined by family and kingship ties. Daar word soveel gefokus op die reënboognasie wat nooit eers was nie. Vals pretensies? Die Boere en Afrikaners was ook nie deel van enige koloniale oornames nie. Was die Britte wat kolonies geskep het en selfs die twee Boere republieke geannekseer het. The institution of traditional leadership has, over the years, performed various governance functions. These governance functions were not exercised in a unified territory, as this only came about later with the formation of the South African nation state. International agreements as well as regional agreements dealing with issues relating or relevant to traditional leadership and institutions form part of the legal framework regulating traditional leadership. South Africa signed this Covenant on 3 October 1994. It provides, among others, in Article 15, that states should recognise the rights of everyone to take part in cultural life. Article 17 of the charter provides that every individual may freely take part in the cultural life of his/her community and that the promotion and protection of morals and traditional values recognised by the community shall be the duty of the state. The charter also obliges the individual to preserve and strengthen positive African cultural values in his/her relations with other members of society and, in general, to contribute to the upliftment of the moral well-being of society. This is to be done in a spirit of tolerance, dialogue and consultation. It obliges him/her to contribute to the best of his/her abilities, at all times and at all levels, to the promotion and achievement of African unity. Article 22 of the charter also provides that all peoples shall have the right to their cultural development with due regard to their freedom and identity and in the equal enjoyment of the common heritage of humanity. This declaration binds all members of the United Nations, of which South Africa is a member. Article 27 of this declaration gives everyone the right to participate freely in the cultural life of the community. leadership institutions have a much bigger role to play as custodians of culture and protectors of custom. However, they also have a clear role to play in the performance of judicial functions within their communities. They define and interpret customary law, and settle disputes in accordance with customary law. Traditional leaders administered the affairs of their communities through customary structures. Each structure comprised the traditional leader, headmen and members of the community. Through these structures, a traditional leader coordinated the activities of his/her community, including ploughing and harvesting, hunting, war expeditions, ancestral worship, rituals and other traditional activities. In addition, through these structures, traditional meetings (izimbizo/dipitso) were called where the affairs of the community were discussed and disputes among members of the community were resolved. These structures were also brought under formal control, and legislation was introduced to regulate them. Customary structures of traditional leadership came to be referred to as tribal authorities. However, the constitution of these structures remained essentially the same. Each structure still consisted of the chief, headmen and some members of the community. 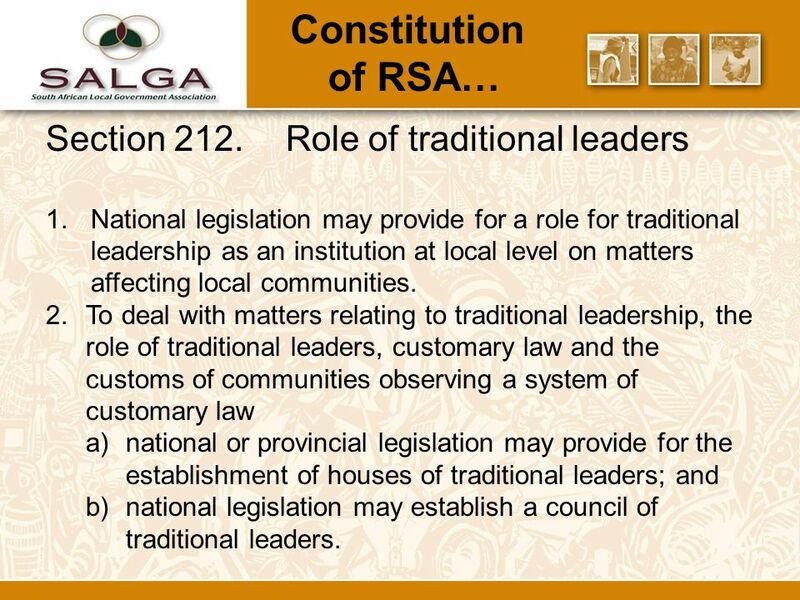 Other structures of traditional leadership, which were not customary in nature, were created through legislation. These structures included community authorities and regional authorities. In the main, community authorities were created for rural communities without traditional leaders and consisted of elected chairpersons and members. In some instances, however, community authorities were established for communities under the authority of independent headmen. Regional authorities differed from the tribal authorities in that, in general, each one was made up of representatives of tribal authorities in the same region, and the chairperson was elected from among the chiefs within the region. In some instances, the most senior traditional leader in status, in the region, was recognised as the only rightful person to chair the regional authority. In some areas, structures of traditional leadership similar to regional authorities were created. These were called councils of chiefs and ibandla laMakhosi and had more or less the same composition and functions as regional authorities. Some paramount chiefs became chairpersons of regional authorities by virtue of their positions. The regional authorities, councils of chiefs and ibandla laMakhosi were given local government functions similar, to a certain extent, to those carried out by municipalities. Most of them, however, lacked the necessary infrastructure and capacity to carry out these functions. As a result, these functions were carried out mainly by the relevant government departments, and, in some instances, these were not carried out at all. In the light of the assignment of the governmental responsibilities by the Constitution to the three spheres of government, it is necessary that the role of traditional leadership structures be redefined so as to align them with the new constitutional arrangements. Secondly, the definition of the role and function of traditional leaders as outlined in chapter 3, also entails that such redefinition should take place. Structures which were created by apartheid and homeland legislation, including community authorities, regional authorities, ward authorities and ibandla la makhosi, should be disestablished. Tribal councils, as they existed before colonialism, and which were based on custom, should be established and renamed “traditional councils”. Their constitution should also be based on custom and customary law. They should be well-resourced and their staff capacitated so that they can play a meaningful role. Historically, traditional leaders, at all levels, were not remunerated. However, they enjoyed certain entitlements, for example, the entitlement to the first fruits, free labour from their communities, large tracts of land, etc. Only after the promulgation of the Black Authorities Act No. 68 of 1951, did the question of remuneration by government arise. Under the homeland system, various homelands initiated their own laws governing, among others, the remuneration of traditional leaders. Even then, the determination of the remuneration of traditional leaders was not uniform across the country. Kings, chiefs and headmen were remunerated at different levels while in some homelands headmen and certain categories of headmen were not remunerated at all. In provinces like KwaZulu-Natal, where there is a large number of headmen, they are recognised but not remunerated by government. In some areas, however, they are remunerated by government. Their remuneration, though largely nominal, is in terms of statutory law. In certain areas communities took action which led to the abolition of the headmanship system. Was on its way to get full indepence (self-determination) – that means, they rule themselves and make their own laws like any other country. At this time, the homelands enjoyed elections and elected their own leaders. Traditional leaders should be custodians of tradition and culture. Their role in respect of governance should be advisory, supportive and promotional in nature. In this regard, they should work with all three spheres of government. The advisory role referred to must also be enhanced by, among others, ensuring that the National and Provincial Houses play a meaningful role in legislative processes and other matters affecting tradition and culture. The legitimacy of those occupying positions within the institution should be beyond reproach. Traditional leaders should be involved in nation-building initiatives and, at the same time, they must promote the rights of cultural, linguistic and religious communities. The various Boer Republics were not part of the British colonial era or their systems. The British Empire came all the way from Brittain and declare war with the Boers and other ethnic groups in southern Africa. 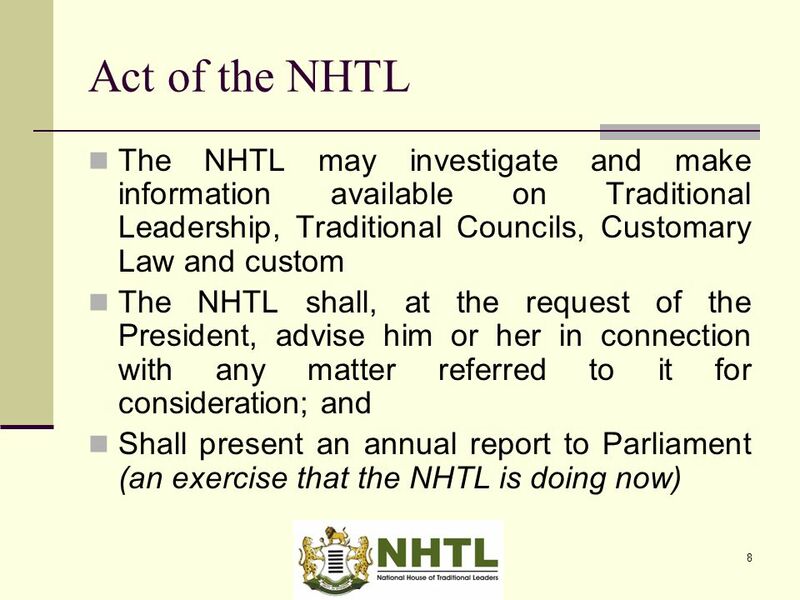 The National House of Traditional Leaders was established in terms of the National House of Traditional Leaders Act No. 10 of 1998, as amended. It consists of 18 members (three nominees from each of the six Provincial Houses). Its members serve on a part-time basis, except the Chairperson and Deputy Chairperson, who are full-time members. The National House has indicated that it wants to become a full-time body and to play a more significant role in the formulation of policy and legislation. The life cycle of the National House should be five years, as is presently the case. Its cycle should be linked to the life cycle of the Provincial Houses. Except for the Chairperson and Deputy Chairperson, membership should be part-time, and members should be drawn from Provincial Houses. The composition of the House will not be changed. However, the appointment/election process should ensure representation of women. Presently, the composition of Provincial Houses differs from province to province. Members of these Houses hold different traditional leadership positions, and, in some provinces, some members are not traditional leaders. In others, headmen and princes qualify for membership. In some instances functionaries of traditional leaders are appointed. In some provinces, the Premiers or the MECs have the power to nominate persons as members of the Houses. Daar is verskeie artikels asook volledige voorleggings aan die parlement gedoen destyds. Sal dit met die tyd almal plaas, asap. Nie almal is op internet beskikbaar nie. Daar is ook ‘n publikasie wat uitgegee is wat gerus bestudeer kan word. Sien die skakel. Daar was skakeling met hierdie Raadslede gewees (telefonies en in persoon) en dit was basies dieselfde wat vervat is in die publikasie. Het die hele een netso ingetrek in artikel in. Het van die artikels ook op ‘n facebookblad en ook besprekings gewees, sal skakels hier plaas.